Gerfried Stocker and Christine Schöpf, who artistically co-directed the Ars Electronica festival this year opted for a title borrowed from director Paul Verhoeven: Total Recall. Memory, its storage or loss, is at the center of the issues discussed during the symposium. But it is also the common thread among the works in the exhibition at the Brucknerhaus. The exhibition Total Recall is held mainly in the large glass gallery of the Brucknerhaus, which looks out onto the flow of the clay-clouded waters of the Danube. Right at the end of the gallery, we notice the four white vertical lines that make up the installation Falling Records by Ei Wada. Coming closer, we realize it is actually light boxes in which tapes are coiled forming curled plumes of extreme elasticity. The buzz that we perceive might be called “four-track” because it comes from four tape recorders placed at the top of the light boxes, appearing to form plinths. The engines of the recorders perfectly symbolize the analog state of music in the twentieth century, simultaneously reversing and accelerating to rewind. We then recognize the most famous of Johann Strauss’ waltzes, “The Blue Danube”, sped up. This amusing reference of the Japanese artist adds an “in situ” character to this kinetic sound sculpture, perfectly evoking analog memory that disappears at the speed at which the magnetic spirals uncoil and fade away during rewinding. Right next to the Wada piece, there is another sound and kinetic sculpture designed by Japanese artist Yuri Suzuki. 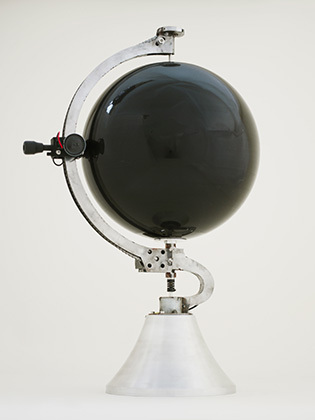 Entitled The Sound of the Earth, it also references the analog world endangered through a material of yesteryear – vinyl. It is an entirely black rotating globe and it takes about thirty minutes for the needle moving across the latitudes to finish its reading. Suzuki, before designing this object of refined forms, traveled the world to bring back music from everywhere, which he then engraved on the single track of the globe. For each country there is a musical match – whereas seas and oceans have been awarded silence, disrupted only by accidents caused by wear. The resulting global music is as repetitive as it is cadenced, even if we sometimes think we recognize the timbre of an instrument or the sound of a voice. This sound journey is none other than the analog result of the hybridization of almost all of the cultures of the world. Or, if there is a music of the world through analog synthesis, this is it. We leave the Brucknerhaus to go to the Offenes Kulturhaus for the CyberArts exhibition, which traditionally brings together the works of the most prevalent artists of the year. 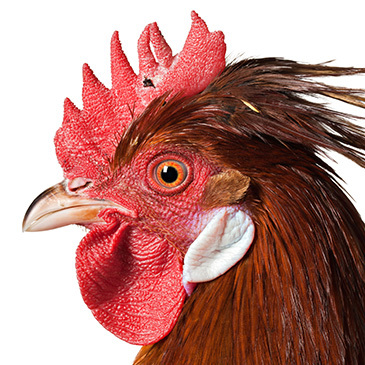 The highly anticipated Golden Nica in Hybrid Art was awarded to the Belgian artist Koen Vanmechelen for his Cosmopolitan Chicken Project (CCP) initiated in 1999 by the cross between a Belgian rooster, Mechelse Koekoek and a ‘poulet de Bresse’. Obtaining the first artistic hybrid, he named it Mechelse Bresse, before crossing it with an English Redcap, and so on until the most recent: the Mechelese Senegal. The artist reminds us that it has been man who over time has shaped the domestic chicken, Gallus gallus domesticus, according to their cultures because there was initially only one wildlife species: Gallus gallus from South-East Asia. The famous ‘poulet de Bresse’ is indeed an effigy of the French flag, with its blue feet, white body and red head. As such, Vanmechelen produces the most cosmopolitan of chickens, with the mixed genes of all the roosters and chickens in the world. Several contemporary art curators, from Venice to Kassel, have been seduced by this multi-faceted project, which perfectly symbolizes all contemporary social, cultural, and racial politics. Honorable mention in Hybrid Art was awarded to Louis-Philippe Demers for his Blind Robot. Visitors to the Offenes Kulturhaus are invited to sit on a high chair, where a blind robot moves into action – discovering the person facing it with a delicate touch. With the “tips of its fingers”, it scans its guest from the hips to the face. 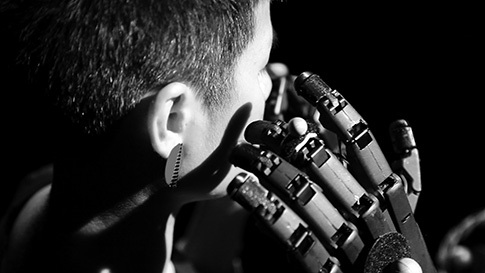 Everything here, from the title of the installation to the movement of the articulated arms, encourages us to imagine the visually impaired human or robot that is not however, there. Nonetheless, everyone participates in the game, trusting the machine without knowing the settings. They give themselves up to a robot that a title and two articulated arms of an extreme delicacy suffice to personify. The exchanges that follow encourage us to reconsider these machines when we free them from the repetitive tasks we usually assign them. Is it not a task that artists are also beholden to, to encourage us to reconsider our relationship with the other, whoever that may be? At Ars Electronica, there are always works that exist as only documentation – mainly with video. This is notably the case when it comes to such performances as Choir Pendulum by Cod.Act. The ephemeral nature of the work did not however prevent the Décosterd brothers, who form the Swiss duo, from winning the prize for interactive art. 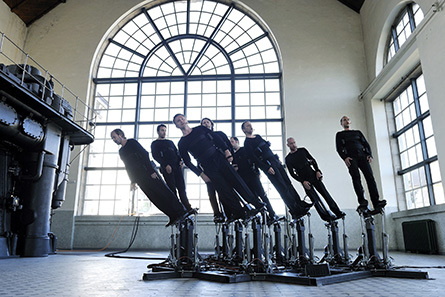 Together they composed the music and built the sprawling stage apparatus to which nine singers are attached – they literally become one with the machine, which moves them independently from one another using hydraulic jacks. The Décosterds think of this machine, both choir and instrument, as a “great lung” outside the body of the singers that merges with them during the period of the performance. They seem to escape gravity when their voices rise, descending again with the low notes. 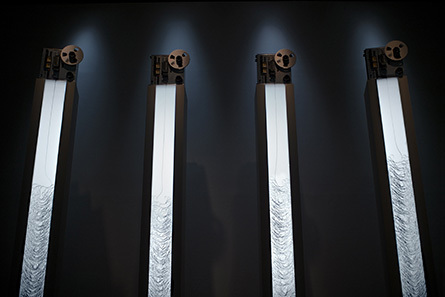 The machine is so precise that sometimes, squeezed against one another, they graze without ever touching – even when the movements appear organic or somewhat chaotic. Men, jacks, machine, and the sound in space form a resonant body all their own. 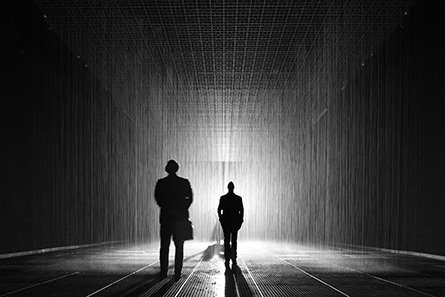 Among the works that are documented in the OK Centrum, there is the Rain Room installation, a recording of which was made in 2013, at the Curve in the Barbican Centre – and has since made its way to video servers around the world. More than anything else, we perceive the white noise of this sequence as the same sound that is popular with the planners and architects who install fountains in malls to mask the sound of more commercial exchanges. This is the sound of water that is said to soothe, even when the volume is high. It is the sound of a strong artificial rain that the members of the Random International collective manage to control, so that it stops along the path of visitors. They act on the rain by interrupting it, as it acts on them by slowing their pace down. In this digital era of allowing all surveillance and controls, from objects to people, the interactivity of Rain Room is in line with other historical kinetic art works. It reinforces the idea that the digital is simply another medium of contemporary art – a distinction that was not lost on the curators at MoMA in New York, where it was introduced last summer. 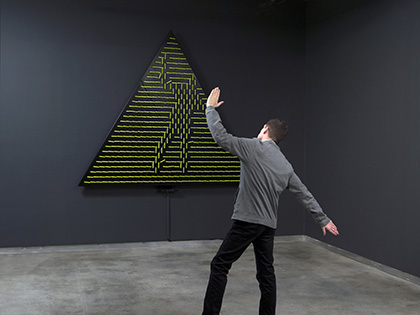 Another installation reinforces the idea that there are obvious affiliations between kinetic and digital trends in contemporary art. Angles Mirror by Daniel Rozin evokes the work of artists like Julio Le Parc, as much by the form and the colour, as the repetition and movement. In its “animated” state, the 456 yellow sticks compose, decompose, and recompose geometric shapes. In its interactive state, the digital medium offers it unlimited possibilities. This is where it sends back the image of whoever is facing it in the form of a low-resolution silhouette. The accuracy is not that of a mirror, yet we recognize those that the device identifies, much as we identify friends in the distance by their movements or postures. Visitors that follow on one after the other are an integral part of the work, which recalls the practice of closed circuit video art – a practice initiated by the misappropriation of the first analog camcorders during the late sixties, which artists today reinvent by adopting the innovations of their time. The mirror has been a recurring element in the history of the visual arts since glass existed, and it is its exact absence that engages us in the video sequence Odile and Odette presented in another exhibition at the OK Centrum, the Biennale Cuvée. The artist Yinka Shonibare MBE has preserved only the gilt frame that separates the two ballet dancers – inspired by Swan Lake, where one represents the white swan and the other the black swan. Their perfectly symmetrical movements give us an obvious mirror, which is reinforced by the fact that a ballerina disappears from the image when the other exits the frame. They are thus similar in everything, just as reflections are similar to portraits. Only the respective colour of their skin differs – and this is perhaps the subject of the work, well beyond the disappearance of the mirror in rehearsals, which constitutes one of the precursory elements of contemporary dance. For the work of this artist born in London of a Nigerian family, it raises questions about the relative importance – when everything brings us together, and of what makes us stand out. Written by Dominique Moulon for MCD and translated by Geoffrey Finch, September 2013.